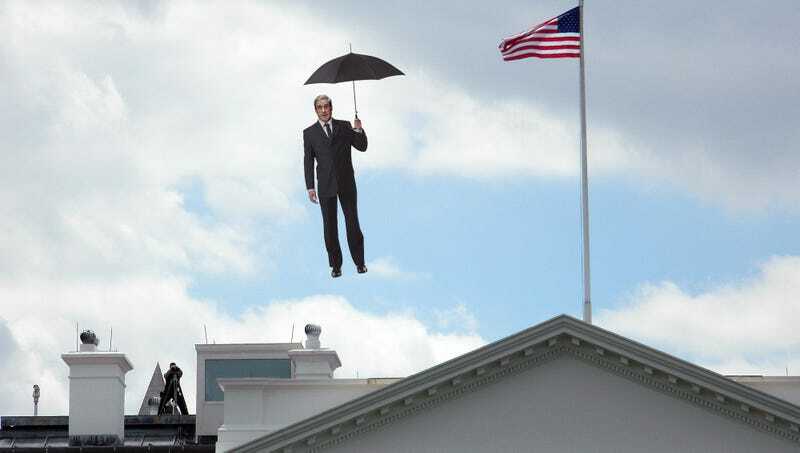 WASHINGTON—Saying that each of them would always have a place in his heart, special counsel Robert Mueller reportedly ascended into the sky with an umbrella Monday after the Trump family promised they had learned their lesson about honesty. “And now, my dear friends, it is time for me to leave you,” said Mueller, opening the large umbrella he had pulled from his magical brief bag and slowly rising into the air as the Trump family tearfully waved goodbye and assured the special prosecutor that the valuable wisdom he had bestowed upon them through song and enchanted adventures would never be forgotten. “I must go and teach other little boys and girls about the importance of always telling the truth. Remember, Trump family: Honesty is the best policy.” At press time, the Trump family was reportedly making sure to cover up any evidence of having any knowledge or understanding about morals and consequences.